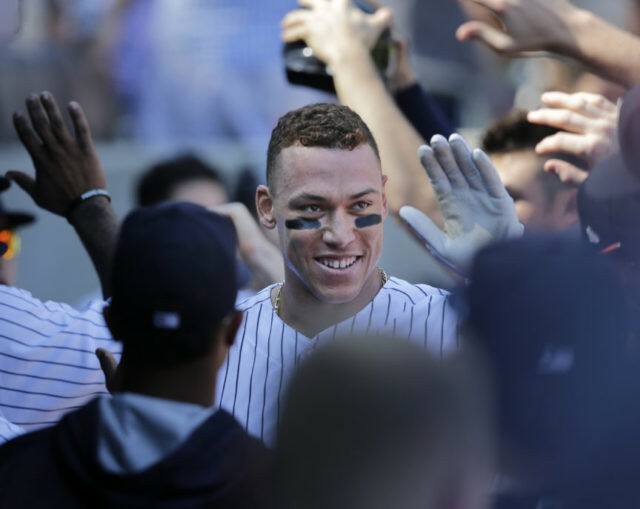 NEW YORK (AP) — Aaron Judge has tied Mark McGwire’s major league record for home runs by a rookie, hitting his 49th of the season. The Yankees slugger hit a two-run homer off Kansas City’s Jakob Junis on Monday, a drive to right-center in the third inning that gave New York a 3-0 lead. The home run was Judge’s 12th of September and fifth in five games. McGwire hit 49 homers for Oakland in 1987, breaking the previous mark of 38 set by the Boston Braves’ Wally Berger in 1930 and matched by Cincinnati’s Frank Robinson in 1956. Judge is second in the major leagues behind Miami’s Giancarlo Stanton, who has hit 57.